While the regulations haven’t changed, the FDA updated their website a while back, and clarified some information (such as the expected way to list botanical ingredients). The FDA also responded to a Petition from the Handcrafted Soap and Cosmetic Guild about the street address requirement, which clarified that a listing in a an online phone directory would satisfy the requirements to omit the street address from the label. This new edition (January 2015) includes this clarified information, and also expands explanations given in various sections of the book based on questions I’ve received over the years. As of June 2018, there have not been any significant changes in the regulations or in the FDA’s application of them. The book is available from various industry suppliers, from the Handcrafted Soap and Cosmetic Guild, which offers a 25% discount on all books (including this one) and also from Amazon.com (qualifes for Prime shipping and is sometimes discounted). This edition includes more background on what laws and regulations are in existence and which agencies enforce the rules for which products. This area has been somewhat confusing to many handcrafters, especially when differentiating between soap that is exempt from cosmetic regulations and soap that is considered a cosmetic. For general interest, there’s a bit of history of the whys and wherefores of the laws and how they came to be. The new edition also includes more pictures and diagrams to give examples of labeling options. Much of the text has been edited to make it clearer, more readable, more “plain English” and – hopefully – that much more understandable. Lastly, there is a chapter covering OTHER (non-labeling) laws and regulations that could affect your business, so you aren’t caugh off guard. 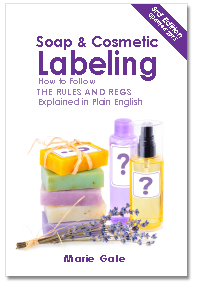 Whether you’re an old hand or a newcomer to the business of soap and cosmetics, you’ll find the information presented here clear and easy to understand, and Soap & Cosmetic Labeling an excellent guide through the maze of labeling regulations.